The Noble family is counted among the ranks of Parish alumni families. Ford ‘14, Quentin and Ava have gone on to pursue horizons beyond our community, from college degrees to passions in music and dance. Yet, they continue to be part of making Parish what it is today – and what it will be. The Nobles exemplify the kind of bold leadership that we seek to model for Parish students. When our community meets their challenge grant of $1 million, the Nobles will have invested $3.7 million in the Limitless campaign since they helped kick it off in 2013. 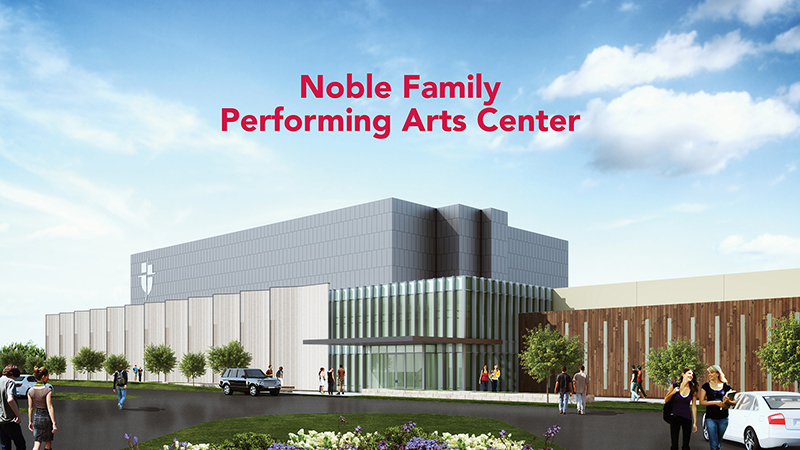 The new performance and community facility will be named the Noble Performing Arts Center in their honor. The Nobles have played pivotal roles in other milestone moments, often electing to remain anonymous while their children were attending Parish. They made possible Gloria H. Snyder Stadium, our baseball fields and expanded programming in science and leadership. Their involvement has always been about listening to the needs of our faculty and students, then investing in well thought-out facilities and programs. We are deeply grateful for their significant and transformational investments. Yet what truly defines them as bold leaders is their commitment to being engaged, positive forces for advancing the communities they care about. We are fortunate Parish is among them. The Nobles understand at a very personal level the limitations of our current performing arts facilities. While Ford, a science scholar and enthusiastic athlete, graduated in the Class of 2014, Quentin and Ava had musical and dance talents that exceeded the capacity of what we offered at the time. They left Parish in high school to pursue the arts at Booker T. Washington High School for the Performing & Visual Arts. The Noble family certainly models this philosophy. We thank them for their bold leadership as lifetime members of the Parish community.